What exactly does it mean to be a close friend? With smart phones, social media and the Internet, the technical barriers to making new friends and keeping up with old ones have all but disappeared. What remains are more subtle borders resulting from cultural diversity, and these can be much more perplexing to navigate. These cultural differences in close friendships are the primary focus of Friends Beyond Borders. It turns out that we in the U.S. think quite differently about our friendships compared to people in many other cultures around the globe. Cross-cultural research shows that people from various cultures can have very different, even conflicting, ideas about what it means to be a good friend. One’s friendly intentions can be seen as patently unfriendly by someone from another culture—they simply wouldn’t fit with how others think about, feel about, and behave toward their close friends. 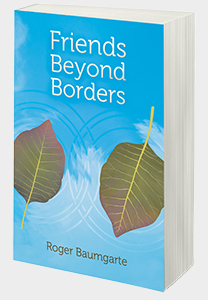 In Friends Beyond Borders, Roger Baumgarte demystifies these differing approaches to friendship. He describes six distinct cultural styles of close friendship, each comparing what might be typical in the U.S. with what would be found in contrasting cultures. Although each culture might have a dominant style of friendship, he makes it clear that all six of these styles can be found within any given culture, especially one as diverse as the U.S. You will come away from this book thinking about your own friendships, whether or not they cross cultural borders, in new and creative ways. You might very well gain a renewed enthusiasm for your closest friends. Beyond cultural issues, there’s also a chapter devoted to Facebook, taking primarily a social research perspective, attempting to explain and defend clearly and empirically what social media have to do with close friendships. The results of these studies surprised even the author. There’s a chapter entitled “Friends make good medicine” which reviews the empirical research demonstrating the numerous benefits, including health benefits, of cultivating close and satisfying friendships. People who regularly make time for their friends tend to live much longer, have lower levels of stress, and are even less likely to catch a cold. These are but a sampling of those benefits. Friends Beyond Borders will inspire you to invest more in your close friendships, and help you to appreciate more fully these important people in your lives. Written with a touch of humor and genuine affection, Friends Beyond Borders offers both a researcher’s perspective and numerous personal anecdotes about the roles that culture and gender play in our experience of close friendship.